At St. Barnabas we are delighted to invite you to celebrate a very special evening with us on Saturday 16 May. Since 1990, Connexions Cuisine have served the people of Beckenham with the highest levels of attention for our private family functions at home, right through to our wedding breakfasts and public community events. St. Barnabas is proud to have the opportunity now to serve Beckenham’s favourite caterers, as we throw open the doors of this magnificent hidden gem of styled French Gothic Victorian architecture, to host the Celebratory Birthday Ball with Connexions Cuisine. 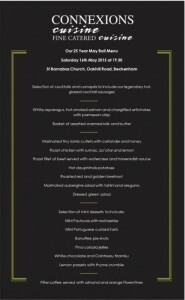 Michele, proprietor of Connexions writes: “We’re really excited to reveal the menu for our Birthday Ball on 16th May. Those of you who remember our Le Traiteur days will recognise some old favourites and we’re pleased to reprise these signature dishes for such a special occasion”. So why not gather together a group of friends, family, neighbours or work colleagues and make up a table? Or you can book your tickets individually to join us for a wonderful evening in a fantastic venue. Just click here to reserve your place.